[1:29] <StyxAlso> Good morning. So, has there been any progress on getting OpenGL programs working on the Pi? [1:37] <MrVector> Hey guys. I'm trying to add chadderz usb driver to my bare metal project, but it fails during linking with an "undefined reference to UsbInitialize()", I'm passing in -l csud to the linker and that seems to work, so I don't understand what the problem is. [1:53] <pksato> bare metal programing have a some kind of api, framework, whatever? [6:34] <TLoFP> hi guys, I am streaming video from the pi via netcat | mplayer. How can I dump the video to file while simultaneously playing it back? [6:34] <TLoFP> is this possible? [6:48] <Datalink> hm, what dies file call the mimetype? [6:49] <TLoFP> Datalink: what do u mean? [6:50] <TLoFP> how do I check mimetype? [7:15] <ItsMeLenny> josePhoenix, i thought as much, but any nomination for controllers? [7:16] <StyxAlso> Anyone know how to play Youtube videos on the Pi in Chromium? [9:55] <StyxAlso> I'm trying to build RStudio Desktop on the Pi. [9:55] <StyxAlso> Last time around, it ran out of memory. So I've decreased the GPU memory, and booted without the desktop. [10:28] <SrRaven> so I just ordered the pi-cam,is there a way to live preview the videofeed? [10:32] <l_r> SrRaven, what is the pi-cam? [10:32] <l_r> the board you mean? [10:33] <l_r> SrRaven, raspivid does not work? [10:49] <SrRaven> should be able to use my mobile no? [11:13] <Mjolinor> does anyone know how long the pulse on GPIO header pin 5 needs to be in order to boot but not boot safe mode? [11:16] <rikkib> There is a switch in the boot config that stops it going into safe mode I think. [11:20] <rikkib> That config.txt switch disables that action. [11:45] <l_r> hifi, what do you mean "pure raspbian"
[11:46] <l_r> not safe then ? [11:58] <l_r> hifi, but who are behing the foundation? [11:59] <l_r> are they the interface to broadcom? [12:12] * SpeedEvil in some ways wishes we diddn't. [12:12] <SpeedEvil> It'd have been nice if someone had started an anlogous project with a sane vendor. [12:20] <ShiftPlusOne> If they could meet a similar price point (including shipping), were as available to the community through the forum, github and the website and supported accelerated opengl es, I'd be all for it. [12:22] <ShiftPlusOne> But yes, it's pretty damn close. [12:23] <ShiftPlusOne> Is it fully open or does it have some closed source code running on the gpu as well? [12:42] <ShiftPlusOne> hm, not bad.... maybe I should look closer into it then. Thanks. [13:08] <marlinc> I'm getting EXT4 data corruption on Raspbian.. Should I use EXT3 instead? [13:15] <marlinc> Is that useful information mm? [13:17] <marlinc> Can the pi itself provide any information? [13:17] <marlinc> I can try a different cable..
[13:24] <ShiftPlusOne> You can, if you don't need USB or ethernet. [13:25] <ShorTie> you got that usb storage powering it's self ?? [13:33] <ShiftPlusOne> I am pretty sure 5v goes to more than just usb. [13:34] <ShiftPlusOne> hdmi seems to have 5v pullups, but I don't know how critical those are. [13:35] <ShiftPlusOne> you're not going to get 1A to USB. [13:37] <ShiftPlusOne> the main polyfuse will trip before that. [13:37] <ShiftPlusOne> I am pretty sure that if they followed the usb specs strictly, half of the usb devices wouldn't work. [13:38] <SpeedEvil> You can draw 1A from 2 USB ports - if the USB ports authorise you to take that amount of current - otherwise you can only draw 2 unit loads - 100mA each from it. [13:39] <SpeedEvil> OTG is to USB host as Ikea furniture is to a tree. [13:42] <ShiftPlusOne> There's also some protection for signals over 5v. If that reference drops significantly then it may trigger when it shouldn't. [13:42] <ShiftPlusOne> I don't know about hdmi though, so I can't really say if that's really a potential issue though. [15:43] <Dumle29> So we figured something along these lines: Use the rapi's GPIO to act as an SD card, then have it feed all the data onto a usb harddisk? [15:44] <Dumle29> SperedEvil: gotcha, we sorta figured, The next thing we thought of was this: Would it be possible to use a usb sd card reader, to act as an sd card, and use that? [15:45] <Dumle29> Well i just figured, I can read and write files with one, But i suppose it won't tell the camera any info about the "card"
[15:46] <SpeedEvil> 32G cards are quite inexpensive. [15:47] <SpeedEvil> I wouldn't want to rely on a gopro recording for days without issue. [15:48] <Dumle29> Is it out yet? [15:48] <Dumle29> then a days driving back. [15:56] <Dumle29> Sandisk has the trademark here i belive, and it'll do the job. [16:15] <mrfloppy88> can i get some help with my pi here? [16:15] <pksato> yes, if you question have a answer. [16:15] <ShiftPlusOne> After you say what the problem is, sure. [16:17] <ParkerR> What command are you trying? [16:20] <ParkerR> Is the a samba server running on 192.168.1.45? [16:25] <pksato> rpi is a share on NAS? [16:25] <pksato> can acess it from windows (or other)? [16:25] <pksato> ip have a name? [16:33] <ParkerR> What was the name? [16:34] <ParkerR> Is there something already mounted to /mnt/cifs? [16:36] <mrfloppy88> i can save files onto my nas with raspistill now? [16:38] <mrfloppy88> it works, thanks all! [16:40] <n3hxs> letstest: Check that the audio is going out the audio jack not the HDMI. This is something I read recently, but I don't remember where. [16:42] <letstest> actually, how do i make the audio go through audio jack over hdmi? [16:42] <pksato> option on omxplayer to select. or, set on alsa. [16:46] <pksato> Yes. if need to redirect other players. [16:49] <pksato> But, I dont know if these cset is valind only for alsa, or change hardware path on bcm. [16:51] <pksato> If I recall, its works with omxplayer. [16:54] <pksato> video from webcam? cam module? [16:56] <steve_rox> are they erratic in movement or solid? [16:58] <pksato> mrfloppy88: saving on NAS? [17:00] <mrfloppy88> i can try a heftier power supply, 1,5A good? [17:01] <SirLagz> the bigger the better ! [17:04] <mrfloppy88> btw, is my assumption correct, use a 12v UPS battery with a pi and camera and make a security cam that can run for a few days when power is cut? [17:07] <kleanchap> I have installed tightvncserver on raspberry pi. I installed real vnc client on Windows but cannot connect to RPI. [17:09] <letstest> i got a usb soundcard, how do i go about directing audio out to that? [18:13] <letstest> hi - sorry about the repost - is there a way with omxplayer to redirect sound to a usb soundcard? [18:16] <letstest> oh. i bought the usb soundcard to use a microphone, any suggestions on how i should do it? [18:17] <pksato> to use a mic? [18:19] <linuxstb> What do you actually want to do? [18:22] <letstest> thank you guys! [18:25] <Joeboy> Is there a recommended way to wirelessly stream audio from eg. my laptop to a pi? Pulseaudio? [18:26] <SpeedEvil> I find pulseaudio in general objectionable. [18:27] <Joeboy> I dunno, it was crappy when it first appeared and I haven't used it since. It might rock now for all I know. [18:57] <javiolo> Hi, how can I read from a 433mhz receiver on the pi? [18:59] <Mjolinor> so why are you asking if you can already do it? 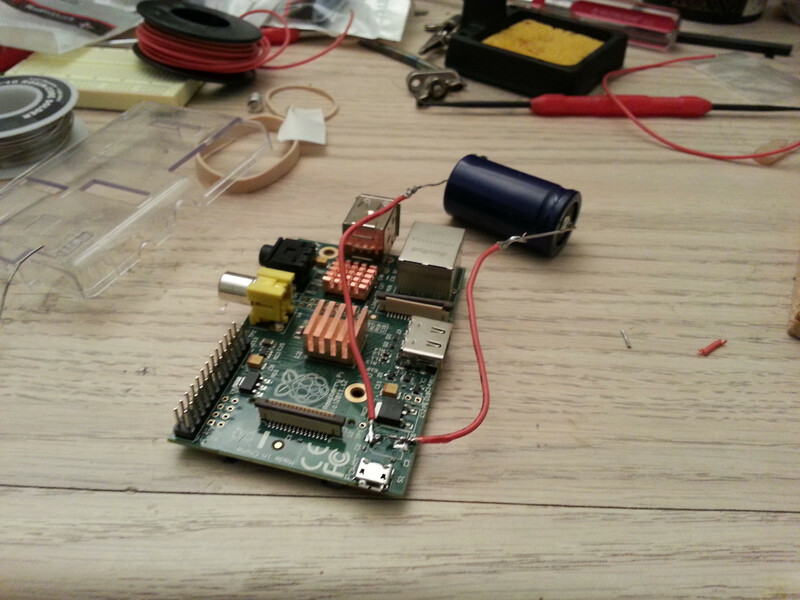 [19:00] <pksato> if, tx send rs232 use rpi uart. [19:04] <pksato> you need to write own protocol. [19:07] <javiolo> I'm missing something, why can't I read with the same setup used with the 433Utils ? [19:10] <ShiftPlusOne> My guess is because c/c++ is not python. You can use some the 'system' function or whatever the python equivalent is, but that's not really "using python"
[19:11] <javiolo> ShiftPlusOne: you mean to execute RFSniffer from 433Utils from python right? [19:13] <ShiftPlusOne> javiolo, yup, but I don't understand your question 100%. "why can't I read with the same setup used with the 433Utils" is a little confusing to me. [19:17] <ShiftPlusOne> You can't use the same setup because wiringpi is for C (though there is a python port available), and 433utils does the work, so you'll have to either port 433utils to python using the python port of wiringpi or the rpio.gpio library (I think that's what it's called). [19:18] <ShiftPlusOne> and 'course you can call c functions from python, but that seems a little dirty for what you're doing. [19:18] <javiolo> ShiftPlusOne: so the other way it's getting the data from the serial port? [19:19] <Joeboy> Anybody want to recommend me a gui mpd client (to run on my ubuntu laptop)? [19:19] <ShiftPlusOne> javiolo, I suppose, but I don't know what I am talking about. [19:22] <ShiftPlusOne> I am guessing that will drag in useless gnome dependencies with it, but since you're running ubuntu, that's probably not an issue at all. [19:23] <ShiftPlusOne> yes, it definitely should be. [19:33] <ShiftPlusOne> Ah well, I am not familiar with the device, so I am sure you folks know what you're doing. [19:33] <letstest> any ideas on what ican check? [19:34] <ShiftPlusOne> lsusb only tells you that the pi is aware that the device is plugged in. Check dmesg to make sure the right module is loaded and it's recognized as an audio device. [19:34] <zsentinel> finally picked up a pi! [19:35] <ShiftPlusOne> zsentinel, 1 usb port or 2? [19:35] <ShiftPlusOne> zsentinel, they don't make rev 1 any more, so it would be. [19:35] <letstest> sorry about ignorance here. what exactly does alsa do? [19:38] <letstest> so what alsa commands would i use to see if my usb soundcard is being recognized correctly? [19:39] <SpeedEvil> I've found one browser that doesn't hammer the CPU. [19:39] <zsentinel> what about elinks? [19:45] <zsentinel> unless i could add a usb wifi adapter and do wifi direct to an android app on my phone? [19:46] <ShiftPlusOne> isn't lspci for ... pci devices. [19:49] <letstest> i see it in lsmod too. cool to learn these commands! [19:50] <ShiftPlusOne> letstest, you've had a look at http://sox.sourceforge.net/sox.html and tried selecting the device with the AUDIODEV variable and -t alsa ? [19:50] <ShiftPlusOne> zsentinel, sure you're not thinking of lshw ? [19:50] <Mjolinor> so in lsmod is it used? [19:51] <letstest> how do i figure out which device has AUDIODEV variable? [19:51] <ShiftPlusOne> I am off, good luck. [19:52] <letstest> whats the basic command with sox to record audio? [19:52] <ShiftPlusOne> lsusb only tells you that the device is there, not whether it's actually recognised and in use properly. [19:53] <zsentinel> letstest: it would be "rec -c 2 test.aiff trim 0 10"
[19:55] <zsentinel> do you know the audio devices dev node? [19:58] <Mjolinor> you turning it into a rail gun then? [19:59] <IT_Sean> i wouldn't count on that. [20:02] <jhave> Anybody there have problem whit raspberry pi crash ? [21:04] <letstest> what should i set AUDIODEV to? [21:31] <letstest> what is the latest distro that you would recommend for a n00b? [21:44] <xkernel> is it a good idea to run production web and mail servers on Raspberry PI ? [21:45] <letstest> is there really a cost savings by doing that? [21:47] <xkernel> XpineX, how many visitors? [21:51] <xkernel> I think Beagleboard will be better choice; it's much powerful I think?? [21:52] <letstest> how easy would it be to connect an LED to the pi that i can turn on and off programmatically? [21:53] <letstest> really? any guides? [21:53] <ShiftPlusOne> letstest, what language do you prefer? [21:53] <ShiftPlusOne> c, python ,bash? [21:54] <Mortvert> XpineX, isn't wordpress a free unsecured shell for anyone that knows what he's doing? [21:55] <Mortvert> Joeboy, yep, that. [21:56] <ShiftPlusOne> Hm, my site gets hammered by script kiddies quite a bit and fail2ban takes care of most of that, but I make sure not to keep anything important on it. [21:57] <Dooley> May I ask a quick question about crontab? [21:57] <ShiftPlusOne> Dooley, better to ask then to ask to ask. [21:58] <Dooley> Let's say I want to run a script as root every 6 hours. I already added a line by doing "sudo crontab -e". Now it seems it's not running- do I have to be logged in as root for it to run? [21:58] <ShiftPlusOne> You do not have to be logged in as root, no. [22:00] <ShiftPlusOne> I don't remember the syntax myself, but it doesn't look wrong. Is the cron service enabled? [22:32] <Dooley> now, do I have to keep my session alive using screen, or will it run even when I close my putty session without using screen? [23:18] <lwizardl> I was wondering if the pi would be strong enough to watch livetv in xbmc being feed from say a comcast tv box?